"Yeah, it was a pretty emotional week," Suggs said. He had difficulty even talking during the weigh-in proceedings, and paused several times to collect himself. "To fight back from all that (cancer and surgery), and be up there in that position, that soon, and in front of a hometown crowd with the opportunity to win – it was a pretty crazy week. Suggs, a local, won the 2007 Forrest Wood Cup here on the same type of pattern he's running. He got rattled on day 1 when a 90-minute fog delay put a wrench into his plans, but he said he was never rattled today. He just ran his stuff and stayed with it. 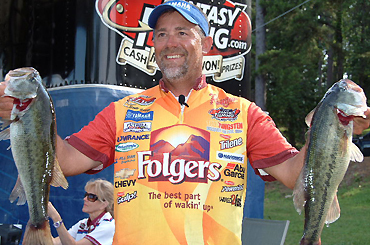 Although it looked as if Scott Suggs was going to win the tournament trophy going away after two days of stellar fishing, the native of Bryant, Ark., suffered a setback in today’s competition after only managing to bring 10 pounds, 13 ounces to the scales at Friday’s weigh-in. Per his usual strategy, Suggs targeted bass on standing timber in an effort to get an early limit. However, today he fell one fish short during the morning hours. Patterns began to reveal themselves today at the Ouachita FLW Tour. Scott Suggs is working his trademark deep stuff and leads with back-to-back 17-pound-plus sacks. Keith Monson moved up two spots to 2nd today on the strength of a 15-02 limit, and his 31-02 total puts him a little less than 4 pounds behind Suggs. Monson's fishing shallow. And Jacob Powroznik weighed his second consecutive 15-pound bag and now sits in 3rd (up from 6th yesterday). He's also fishing shallow.